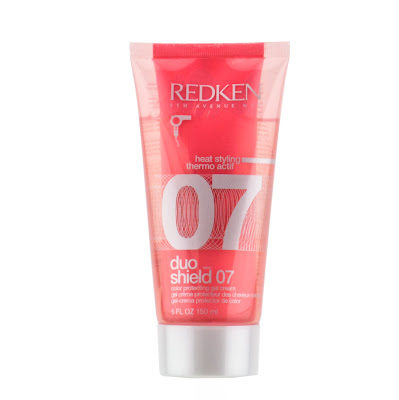 Last time I was at the salon, I bought Redken’s Duo Shield 07 because I had seen my hair stylist use it on me a few times prior and I really liked the results. The product is part cream, part gel. It’s literally a tube of cream inside a tube of gel, but when you squeeze it, a little of both come out – unmixed. 2. It contains ceramides for strengthening hair. 3. Contains cranberry oil for conditioning. 4. Helps preserve color vibrancy. 5. Adds volume without weight. 6. Helps hair hold shape without feeling sticky or heavy. 1. Has no smell. Hair products get major bonus points when they smell amazing (like Moroccan Oil and Biolage shampoo!) and this one smells like….nothingness. I have fine hair, so I generally have to be very careful about which products I use (and how much of them I put in my hair!). That said, I use a very tiny amount of this product and am able to spread it evenly throughout my hair. I can tell that if you use too much of this at one time, it has the potential to make your hair tacky, so trust me when I say that a little goes a long way! It’s going to last a long time at this rate. This product gives my otherwise limp hair hold and makes it look very full. I’ve used it for over a month and can definitely say it’s worth the $20! I will have to try this! I have fine hair as well and have a difficult time finding products that actually make my hair look better! I use a combo of Redken Glass01 and Anti Snap… will have to give this one a try! I'll definitely be purchasing this because my color fades so fast and my hair is so fine. I'm super picky about my hair products as well because I also have ridiculously fine hair. This one sounds so nice! How do you keep your hair so pretty and blonde? I swear I get highlights and am never as blonde as I want and it fades really quickly. I'm rather annoyed lately with the blonde thing and I've been getting highlights since I was 16. Tell me your secrets!